At first sight nothing could be more different than textiles and electronics. Put opposites together and you can maybe even bring historical yarns to life. That's what Queen Mary's G.Hack team helped do. They are an all-woman group of electronic engineering and computer science research students and they helped build an interactive art installation combining textiles and personal stories about health. In June 2011 the G.Hack team was asked by Jo Morrison and Rebecca Hoyes from Central Saint Martins College of Art and Design to help make their 'Threads & Yarns' artwork interactive. It was commissioned by the Wellcome Trust as a part of their 75th Anniversary celebrations. They wanted to present personal accounts about the changes that have taken place in health and well-being over the 75 years since they were founded. Jo and Rebecca had been working on the 'Threads & Yarns' artwork for 6 months. It was inspired by the floor tiling at the London Victoria and Albert Museum and was made up of 125 individually created material flowers spread over a 5 meter long white perspex table. They wanted some of the flowers to be interactive, lighting up and playing sounds linked to stories about health and well-being at the touch of a button. Central Saint Martins College Textile students worked with senior citizens from the Euston and Camden area, recording the stories they told as they made the flowers. G.Hack then ran a workshop with the students to show them how physical computing could be built into textiles and so create interactive flowers. Short sound bites from the recorded stories were eventually included in nine of the flowers. The interactive part was built using an open source (i.e., free and available for anyone to use) hardware platform called Arduino. It makes physical computing accessible to anyone giving an easy way to create programs that control lights, buttons and other sensors. The audio stories of the senior citizens were edited down into 1-minute sound bites and stored on a memory card like those used in digital cameras. 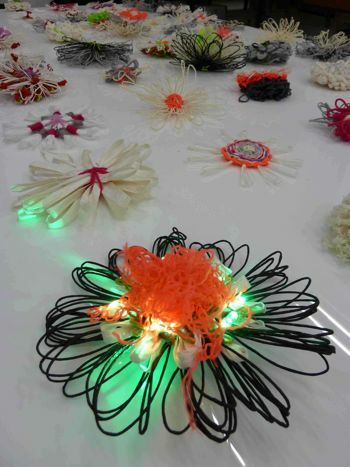 Each of the nine flowers were lit by eight Light Emitting Diodes (LEDs). They are low energy lights so they don't heat up, which is important if they are going to be built into fabrics. They are found in most household electronics, such as to show whether a gadget is turned on or off. When a button is pressed on the 'Threads & Yarns' artwork, it triggers the audio of a story to be played and simultaneously lights the LEDs on the linked flower, switching off again when the audio story finishes. The artwork had to work without problems throughout the day so the G.Hack team had to make sure everything would definitely go smoothly. The day before the opening of the exhibition they did final testing of the interactive flowers in their electronics workshop. They then worked with Central Saint Martins and museum staff to install the electronics into the artwork. They designed the system to be modular. This was both to allow the electronics to be separate from the artwork itself as well as to ease combining the two. On the day of the exhibition, the team arrived early to test everything one more time before the opening. They also stayed throughout the day to be on call in case of any problems. Leading up to the opening of the exhibition were a busy few weeks for G.Hack with lots of late nights spent testing, troubleshooting and soldering in the workshop but it was all worth it as the final artwork looked fantastic and received a lot of positive feedback from people visiting the exhibition. It was a really positive experience all round! G.Hack and Central Saint Martins formed a bond that will likely extend into future partnerships. 'Threads & Yarns' meanwhile is off on a UK 'tour'. Art may have brought the textiles, history and health stories together as embodied in the flowers. It's the electronics that brought the yarn to life though. G.Hack is a supportive and friendly space for women to do hands-on experimental production fusing art and technology at Queen Mary University of London. As a group they aim to strengthen each other's confidence and ability in using a wide range of different technologies. They support each other's research and help each other extend their expertise in science and technology through public engagement, collaborating with other universities and commercial companies. The members of G.Hack involved in 'Threads & Yarns' were Nela Brown, Pollie Barden, Nicola Plant, Nanda Khaorapapong, Alice Clifford, Ilze Black and Kavin Preethi Narasimhan.